Donald Miralle/Getty ImagesNo. 14 Marshall shocked the Shockers on Friday to move on to the second round of the NCAA Tournament. No. 13 Marshall took down No. 4 Wichita State in yet another stunning March Madness upset. The game was enthralling, but the ending included poor officiating and lengthy replay reviews that ruined the pace of play. 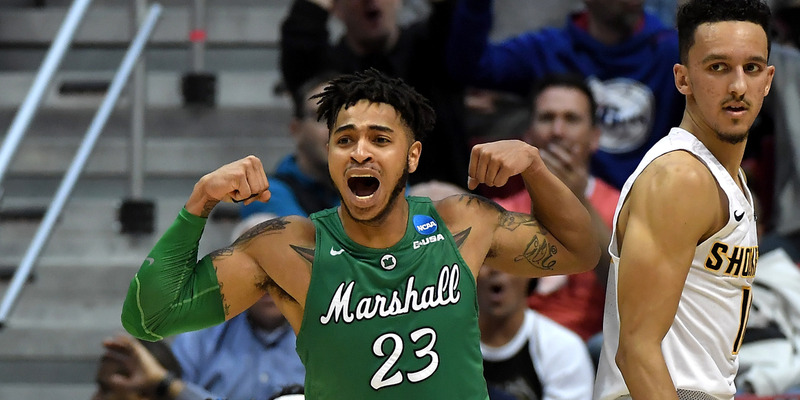 It was Marshall’s first NCAA Tournament win in school history, earning the Thundering Herd another game on Sunday with a spot in the Sweet 16 on the line. The No. 13 Marshall Thundering Herd took down No. 4 Wichita State on Friday, earning their first NCAA Tournament win in school history. The result was yet another exciting addition to a series of March Madnessupsets, but the end of the game was marred by a series of questionable calls and painfully long reviews by officials. The drama started in the final minute, as both teams fought under the basket for rebound and Marshall looking to hold on to a three-point lead. After the ball went out of bounds, referees awarded possession to Marshall, before conferencing for a lengthy review of the play. A replay appeared to show the ball go off of Marshall’s Jannson Williams pretty clearly, but that’s not what the officials saw. You can judge the play for yourself below. The blown call meant robbing Wichita State a chance to tie the game with under a minute left. Instead, it gave possession back to Marshall to defend their lead. Experts and fans watching the game knew that the Shockers had had an opportunity stolen from them. Wichita State just got so screwed. The ball was out on Marshall and the replay showed it a dozen times. Wow. Marshall would sink another basket to stretch the lead to five before yet another stoppage took place. The end of basketball games can be drawn out, but this was unprecedented. It was a disappointing way to end what was a thrilling game, but Marshall will take the victory all the same. Their first NCAA Tournament win in school history, the Thundering Herd’s takedown of Wichita State earns them a second-round matchup with either West Virginia or Murray State, with a spot in the Sweet 16 on the line.